When traveling, we always like to stop at the local brewpubs. Eric (DH) is a home-brewer, and as such, the two of us have become beer snobs connoisseurs. 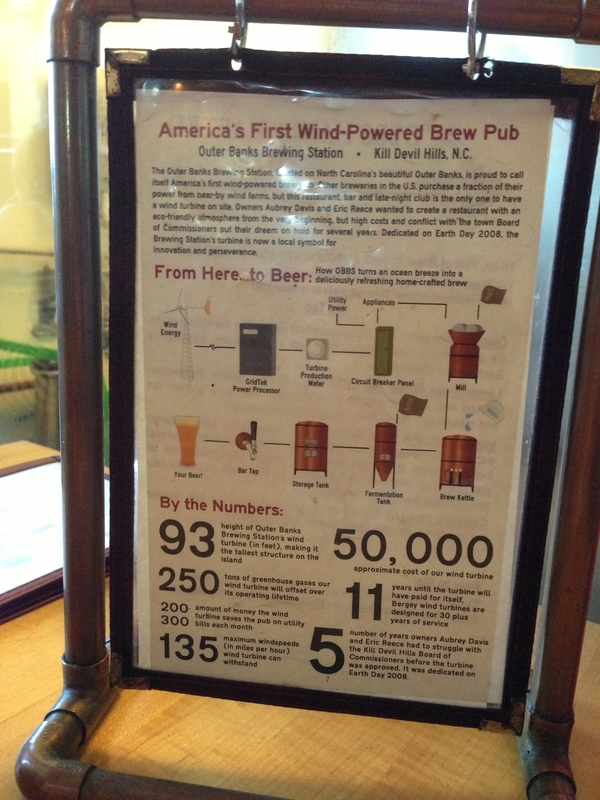 After we left the Wright Brothers landmark, we dropped in to the Outer Banks Brewing Station, also in Kill Devil Hills, conveniently located very near the Wright Brothers landmark. Great place! Great beers, too. I had a LemonGrass Wheat Ale, and after tasting I could easily understand why it is a World Beer Cup Silver Medal winner. Eric had an Intergalactic IPA, also medal-worthy. They served a decent lunch to boot. We’d already decided before we left for our trip to eat only one meal out, and the other two “homemade” in our efficiency room or packed and taken with us. So, we really made the most of our one restaurant meal each day. We started with Fried Tuna Bites (from their menu: “Caribbean Jerk Seasoned tuna bites served with mango salsa”). YUM! I could have made a meal out of these alone. However, I did go ahead and order a sandwich: Portabella Press sandwich (“Marinated and grilled portabella, red onions, mozzarella, sun dried tomato tapenade, spinach, & pesto on house bread”). This was a hearty sandwich and I took half of it with me for dinner. Eric had the Station Burger (“Half pound of beef burger marinated in beer. Hand pattied and spiced by an actual human being”). I hope the photo comes out to be legible, because it’s really impressive what these guys have accomplished. Hats off! Anywho, that’s enough for tonight. Tomorrow, I’d like to give a thanks to one of the nicest kennels we’ve known. 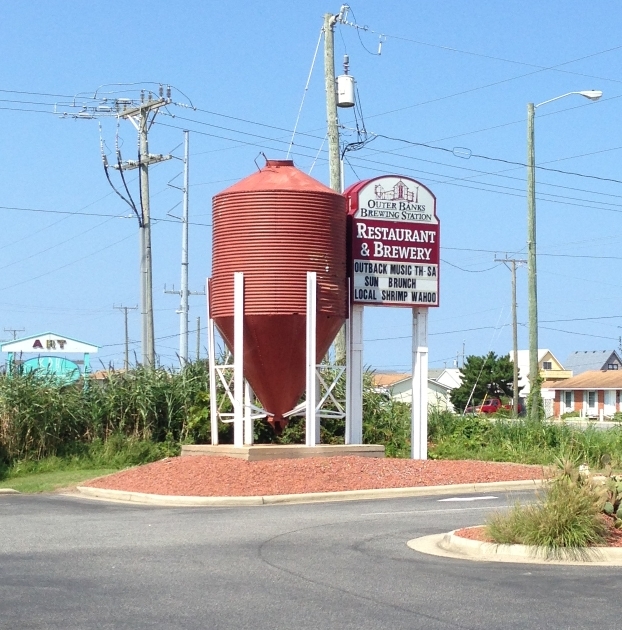 This entry was posted in Blog Update and tagged beer, brewery, kill devils hills, outer banks, travel. Bookmark the permalink.